This exclusive villa has a large terrace with private pool. Thanks to the solid construction it can be rented all year round. The south-west orientation gives you the soothing sun all day. On the ground floor you will find the comfortably furnished living area (over 60sqm) An open fireplace provides cosiness especially in the evening. Communicative equipment as a 28 "LCD satellite TV, home cinema / stereo and a free Wi-fi Internet access provide amusing entertainment. 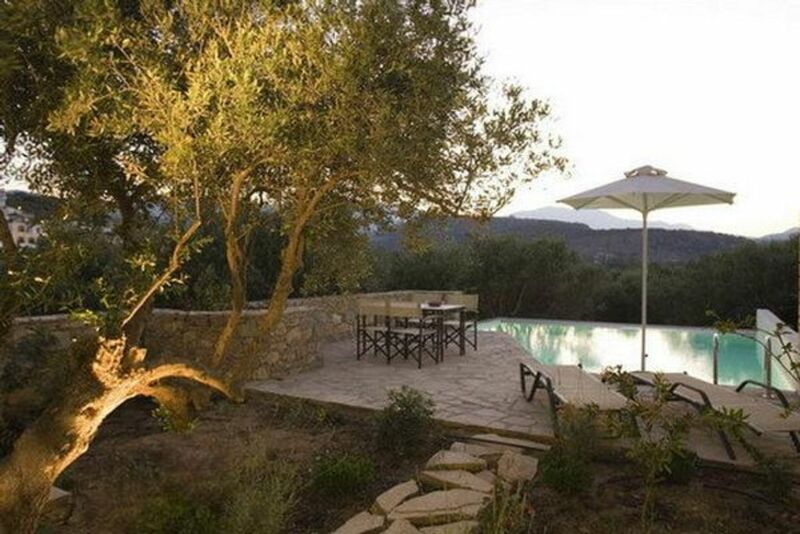 The natural stone paved terrace, approx 85sqm, with private Swimmigpool, is easily accessible via the living room and is surrounded by ancient olive and citrus trees, which protect your private atmosphaere. The living area is connected by a dining table with the functional, modern kitchen. A marble staircase leads upstairs to two bedrooms with large balcony. From there you have beautiful views over olive groves to the sea. Each bedroom has its own marble bathroom, one with Jacuzzi tub, the other with a shower.------------------------------------------------------------------------------------------------------------------------ ISTRON TOP CARS - the name says it all! You want to rent a car during your stay? Very happy we would like to serve you! Kindly visit our website - choose your preferred model and get a good offer immediately! We handover you the car in person! From the Airport Heraklion or another place you want! Cot for adults: per person and week available and included in price (Mandatory). Cot for adults (per person and week, according to consumption 0 EUR). Parking facilities (per property and day, included in price 0 EUR). Pet (per property and day, included in price 0 EUR).